Here is the latest update to the list of enhancements in SAP Enterprise Architecture Explorer. 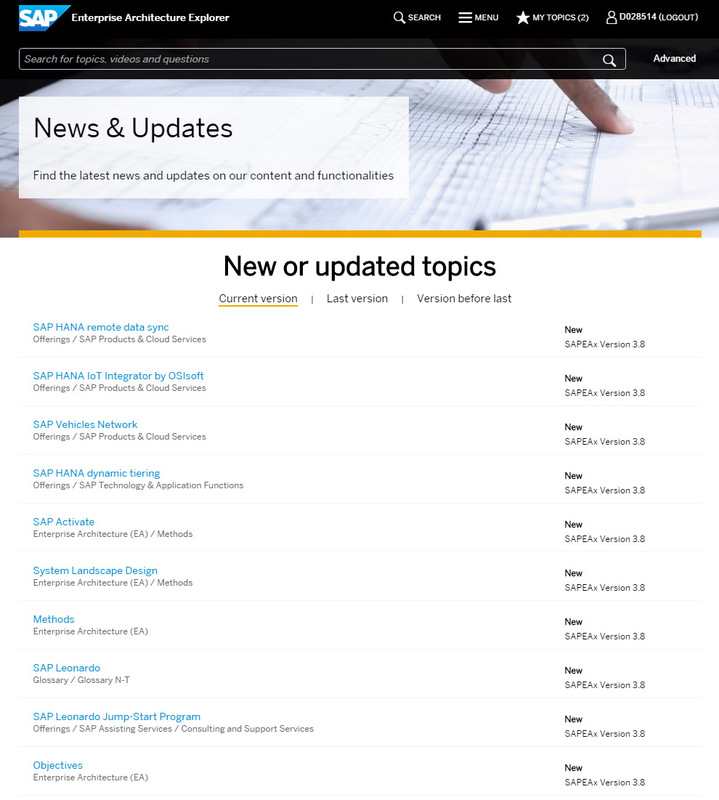 Important: Since Version 3.8, we do have a dedicated news page in SAP EA Explorer. As a result, there is no more need to maintain this blog. Please use this news page to find the latest updates on content and functions. If you have any feedback, please let me know. You can also reach me via Twitter or by mail. Please find all content improvements directly in the SAP EA Explorer via the news page. With this version, we have introduced a new feature called news and updates page. Here you can easily find which topics are new or updated in one of the latest three versions. Also you can find a list of documents that have been recently added or updated as well as view on the tool functions that have been introduced.You can find the news page via the link mentioned above or via the menu item at the top bar of the user interface of the SAP EA Explorer. Also we have moved a lot of existing topics into this new glossary section. We will further enhance this part of the content over the next months. Can I install different technical systems of products on one hardware server? What is a publish/subscribe messaging pattern? What kind of constraints need to be considered before implementing an edge computing architecture? What technologies does SAP offer for edge computing? Which kinds of industries is SAP Dynamic Edge Processing applicable to? This version, again, was highly focused on the expansion of the IoT content. We also did several enhancements to functionality (Semantic Viewer – Autopilot) and usability. SAP EA Explorer main page now includes a featured topic section. At the same time, we removed the old featured topic section from the browse topics area. We have added an autopilot function to the semantic viewer to simplify the exploration. If this function is activated, the explorer shows you only one relation type, which is typically the one that is of most interest in the context of the topic you are looking at. This function is based on what I have mentioned in version 3.3 as “Relations sorting adjustments”. These adjustments are still going on. So, the autopilot might not always provide the best relations, yet. We have extended the Beta until January 2017. With all the feedback we received so far, we plan to heavily improve the semantic viewer with version 3.5 or 3.6. Based on our regular usability tests, we have started a larger usability improve activity. Though, the main part of these improvements will be implemented in upcoming versions 3.5 and 3.6, we already did first improvements that include new buttons for “Compare with my topics” and “Explore with the semantic viewer” located at the topic detail page as well as several text changes. In this version, we have put our focus on the expansion of the Internet of Things (IoT)-related content. Of course, this is just the second step of a longer journey of content creation for IoT and more will follow in the next versions. Additionally, this version also includes some tool enhancements like the twitter section and the latest improvements to the comparison function. What is SAP HANA Vora? What is the relationship between SAP HANA Vora and SAP HANA platform? What is the relationship between SAP HANA Vora and Apache Hadoop and Spark? How do I use SAP HANA Vora if I already have Apache Hadoop and Spark installed? The SAP EA Explorer main page includes a Twitter section, that lists tweets from our team that inform you about latest news in the context of IoT, UX, Landscape Architecture or Enterprise Architecture. In the next version we want to expand this feature to a dedicated news page. Stay tuned. We did several technical adjustments to the relation sections of the topic pages. It will take some time to adapt all topics to the new settings. But in general you will find more and more topics now, where the relation section points to you the types of topics that are typically the most relevant for you. We have realized that many users did not see the filter options in the Video and FAQ page as they were hidden by default. We have changed that. The comparison function (e.g. Web Dynpro ABAP vs. SAPUI5) We have realized that many users did not see the filter options in the Video and FAQ page as they were hidden by default. We have changed that. We did several performance enhancements, to reduce the page load time. This is the first version under the new name of SAP Enterprise Architecture Explorer. We have changed the name two weeks ago, already. Since last week, we have already activated the redirects from the “old” SAP UX Explorer towards the new SAP EA Explorer. Besides the name change, we have added new content. On the one hand, this is new content in relation to Landscape Architecture. On the other hand this is content related to the Internet-of-Things (IoT), which is now the second IT focus area we have introduced beyond User Experience (UX). All three IT focus areas can directly accessed via the links above or via the new section called “Focus Areas” at the main page. In regards to IoT: The content we have uploaded so far is a first and initial set of topics. We are going to extend these topics soon. We also will bring in a lot of additional IoT topics over the next months. So please stay tuned for additional content to come up, soon. Please find all additional details regarding the changes in version 3.2 below. This is the last version under the name of SAP UX Explorer. As mentioned in version 3.0 and in the blog “SAP UX Explorer is going to grow: SAP Enterprise Architecture Explorer is around the corner” we are going to switch the name to “SAP Enterprise Architecture Explorer”. This switch will be done by next week. This version 3.1 is just a little update. Version 3.2 is expected in the second week of April with a lot of new topics coming up in the area of landscape architecture. With version 3.0 starts a new remarkable time for the SAP UX Explorer, not only because it will probably be the last version where we call it SAP UX Explorer. This version releases new topics and tool features, introduces new types of content (e.g. the viewpoints) as well as an simpler content structure. Landscape Architecture is the first new area of information beyond UX that is now available through the UX Explorer. Let’s have a closer look to the details. We have reworked the whole content structure of the Explorer. If you access the browse topics area, you will notice that the main categories have significantly changed. With the initial start of landscape architecture, we got a lot of new topics in our database. I have condensed this list and categorized it, just to keep this blog somehow readable. The closed beta phase has ended and the semantic viewer is available to everybody under the conditions of an open beta phase. IMPORTANT: At the moment, the semantic viewer is only optimized for the Chrome browser on desktop. IE is currently not supported. Other browsers as well as mobile devices might work but are not tested or optimized. You can access the semantic viewer with a new button in the page header (see next improvement “Topic Detail Page Improvements”). If you have feedback to the semantic viewer, don’t hesitate and get in touch with us via uxexplorer@sap.com. A new function button launches the semantic viewer with the current topic in focus. It was already possible in the Explorer to print a topic detail page (or use this to convert a page to PDF with a local PDF converter). The improved function allows to print multiple topics at once while defining which parts of the topic information (e.g. features, benefits) shall be printed. You can reach this functionality via the favorites section at the top bar. To customize the output, simply click on “show options” to the left of the print button. This version might look like not much has changed. Behind the scenes, however, we are already preparing a lot of new content which we plan to introduce by the end of October. This work goes along with what I have described in my blog “How Enterprise Architecture can help me to improve user experience“. As such, the next upcoming version will provide a lot of new stuff, beyond UX and will start a transition (and name change) of the SAP UX Explorer into the SAP Enterprise Architecture Explorer (or short SAP EA Explorer). I will provide another blog on this in the next two weeks to keep you updated on our plans. From now on, you will be able to see which Topics have been created or updated since your last visit. This function can be reached by the menu at the top right. This function requires you to log in. So please make sure to use the login function first. This function was requested since a while. Now it’s finally there. If you are in a topic that contains a facet “documents”, you will see when these documents have been updated the last time. In the last week we have spent a lot of time on improving the semantic viewer which is still in closed beta. We had, however, the chance to create two new topics in the SAP UX Explorer. For the new topic “Enterprise Architecture (EA)” we also started a new series of whiteboard videos. This is just the initial start in the area of Enterprise Architecture. After summer vacation, we will continue with this and will expand our content with many new EA-related topics. This will also include that we completely restructure our concerns section. Expect more to come by October this year. In this version we have focused on the semantic viewer which started its closed beta this week. Nevertheless, we also have introduced some new features and a set of new topics. You can now share SAP UX Explorer content from every page via the most common social networks. In all topic pages you will find a new icon at the right just below the horizontal image. If you share via these buttons, you will share the URL of the page. If you have opened one of the elements in the accordion of the page, the share will include the extended URL that links directly to the right place in the accordion. For example, if you want to share the roadmap information of SAP Screen Personas, you can go to the SAP Screen Personas topic, open the “Roadmap” accordion and then share via one of the buttons at the top. Additionally, you will find the extended footer at the bottom of every page. The share buttons in the footer will always just share the direct page URL. Any clicks you did on the page are not relevant here. On every page, you will find a “Contact Us” function to the right. This function leads you to our newsletter subscription page or starts a new mail addressed to us. This version includes several bug fixes, some little tool enhancements as well as new content. We received the feedback that people wanted to search across the FAQ page. Unfortunately, the questions and answers that were “hidden” in the closed accordion were not visible to the browser search. As a solution, we introduced a new icon in the FAQ page that allows users to expand all questions and answers. Now the browser search can be used. Search doesn’t highlight lines when navigating with cursors. Favorites are displayed in My Favorites section in the same sequence as added (latest on top) – Impact: All favorites you might have stored will be lost. This version includes major changes to the visual and interaction design as well as several new topics in our content. Roadmap Information for all relevant topics updated according to “SAP Product Road Map – SAP User Interface Technologies“. We also have new “SAP UX Explorer – Short Videos” available. Our new design collects all these videos in the “watch videos” section of the Explorer. This version is a pure content improvement. None this time, except some bug fixes. This version is a pure content improvement including roadmaps being available without the need to login, now. Roadmap information transferred from PDF document “SAP Product Road Map – SAP User Interface Technologies“. Roadmap information is now available to everybody without the need for login. In this version we did some preparations for version 1.6 and – as usual – we have added new content to the Explorer. For example, you can now compare and understand what the different sites like SAP UX Explorer, SAP UX Community and others can provide to you and how they correlate to each other. The assisting services is a good starting point for that. As preparation for additional changes in version 1.6, the “Category Overview” and “Typical Questions” link are removed from top area. At the same place you will now find “Explore Relations” (only visible where you can inspect a topic), “Collected Topics” and “Help”. With this we want to focus our users to navigate by exploring the relations between topics rather than always restart from the beginning (like with the collection view before). If you may not see the changes in your browser. Just reload the page. The topic-specific discussion function was moved from the toolbar on the right to the topic header. As before, the discussion function leads you directly to a the matching place in SCN to discuss about your current topic with others. Like in version 1.3 there were still many things to do in the backend to set preparations for new functions to come in 2014. Nevertheless, while many improvements are not visible to you yet, we have at least added more questions to our “Typical Questions” and made the login procedure optional. What’s the difference between SAP Fiori and SAPUI5? What’s the difference between SAP Fiori and SAP Screen Personas? What’s the difference between SAP NetWeaver Portal and SAP NetWeaver Business Client? Which technology should I use to develop new applications? Will SAP CRM user interfaces be migrated to Web Dynpro ABAP ? Why does SAP offer and use different UI technologies (UI frameworks, UI clients, UI tools and so on )? What’s the future of Web Dynpro ABAP? Is Web Dynpro ABAP suitable for mobile applications/scenarios? Will I be able to theme all my SAP applications with the UI theme designer? Is an open source version of SAPUI5 available? Can I use SAPUI5 outside of an SAP landscape? Can I build ‘SAP fiori-like’ applications with SAPUI5 against any SAP back-end functionality and even against third3rd- party systems? I already use the SAP NetWeaver Portal. Should I still evaluate the SAP NetWeaver Business Client? Where can I get further information about SAP Design Services or request a service? How does the SAP NetWeaver Visual Composer fit into SAP’s UX strategy? What is SAP’s browser support strategy ? This version was basically important for us, to re-build and optimize our backend. As such, most of the new things we achieved are unfortunately not visible for you. Nevertheless, there are some news that are visible as listed below. We have added www.sap.com/uxexplorer as additional redirect to SAP UX Explorer. This version contains new content as well as some tool enhancements and bug fixes. Each item can now be pinned. As a result, the specific item gets added to the list of “Collected Items” in the toolbar to the right. To pin an item, simply click on the star icon at the top right of the header. Items can be compared with each other. The comparison data is partly pulled from the relations maintained in our semantic network. We will also add category specific item attributes over time to improve the value of the comparison. Currently, the items that include specific item attributes are SAP NetWeaver Business Client for Desktop, SAP NetWeaver Business Client for HTML, SAP GUI for Windows, SAP GUI for HTML, SAP NetWeaver Portal. However, all items can be already compared from their relation point of view. Just check it out. To compare two items, you need to pin them first. The toolbar on the right indicates, how many items you have pinned. Then use the toolbar on the right to mark the one you want to compare and click the compare button. You will see the comparison view, then. Footer area now contains a link to open a mail to uxexplorer@sap.com. There is a new facet available called “videos”. Over time we will add more and more videos to this facet. The category view now also includes the short text of each category and a link to the according item. Fixed: Toolbar on the right side of the screen is too small. Many users don’t find it. The FAQ is very useful, Thanks. The link to SAP Design Guild in the FAQ doesn’t work (Question ID: 17).